A trip up the Caura River in Venezuela's Bolivar State to the thundering majesty of Para Falls is everything you could want from a jungle adventure and more. So what could be better than stumbling across a Yekuana Indian fiesta in full swing and being invited to try the local homebrew? That's what happened to Russell Maddicks, who enjoyed an unforgettable night with his new-found chug-buddies in the Yekuana village of Nichare. After an eventful first night on the Caura River that included an encounter with a massive tarantula, some noisy howler monkeys and a delicious feast of roast chicken, our second day brought us to the small Yekuana village of Nichare, home to some 90 people from seven families. There were ten of us on the trip, seven foreign tourists, myself, the boatman and our guide, Juan Carlos Ramirez of Akanan Tours. My first impression of Nichare was of a neat collection of picture-postcard huts with mud walls and palm-thatched roofs. The village was reached by a steep slope of yellow clay that led from the river bank. As we got closer, a group of kids appeared and showed off by diving into the river and clowning about, sliding down the slippery river bank into the water and then swimming up to our bongo - a traditional dugout canoe carved from a single tree trunk. These kids didn't beg for sweets or biros they just smiled and ran about excitedly as we gingerly made our way up the bank. As we entered the village it was good to see there was no litter. Everybody was barefoot, the men wearing a pair of shorts, women in a skirt and T-shirt. Unlike indigenous communities in other parts of Venezuela, there was no sense of poverty here, just a seemingly comfortable co-existence with the jungle and the river. But Nichare is a place of contradictions. Only four hours boat ride from the road at Las Trincheras it is the closest Yekuana village to "civilization," and hence straddles the border between two worlds: the more traditional Yekuana villages above the Para Falls, and the criollo world to the North. The villagers have been sending their children to study High School in Maripa or Ciudad Bolivar for years, and it has brought major changes, some good and some bad. Purists lament the fact that traditional dress is now only worn on special occasions - the few times of the year when the bamboo flutes and monkey-skin drums are dusted off and the sounds of old chants and songs once more fill the forest. They might also complain about the loss of traditional healing practices to modern medicine, epitomized by the rather ugly breeze block dispensary. Even the baskets and wood carvings for which the Yekuana of Nichare are famous have changed over the years, affected by the tastes of big-city buyers who order in bulk, favouring the number of animals on a basket, over tradition and authenticity. But the villagers seem unfazed by all the fuss about their vanishing traditions and seem to have adapted to the encroachment of the world outside without losing their sense of cultural identity or pride. They still speak Yekuana among themselves. They give their children Yekuana names, although they are rarely divulged to outsiders. They hunt with blowpipes and fish with barbasco, a plant toxin that suffocates the fish and brings them to the surface. They also make the best curiaras in the country, justifying the name "Yekuana", which roughly translates as "canoe people." More importantly, and perhaps the key to their survival, they show no signs of the inferiority complex that afflicts many other tribal groups, and seem to have been able to take from Western Society only what they need, like medicines and power generators, and leave what they don't. At first it looked as if we wouldn't be able to stay because the village was celebrating a three-day festival, "not for New year," as the village headman German Rodriguez explained, "but for the new yuca," the root vegetable that provides the Yekuana with most of their sustenance. But eventually room was found for us to hang our hammocks in the huts Rodriguez uses as a kitchen and workshop. As night fell the celebration kicked off in the palm-thatched roundhouse at the centre of the village and the sounds of merriment drifted over to where my fellow travellers were bedding down for the night. Curious, I strolled over to investigate and found young couples shuffling back and forth to a merengue beat that crackled unevenly from two speakers. The sound system was hooked up by a few bare wires to a car battery that also powered the single bulb that lit the scene. Most of the young men were standing around drinking out of round gourds. The girls, adorned with strings of blue and white beads tied tightly above the ankle and below the knee, walked through the crowd refilling the men's gourds with something that looked suspiciously like watery porridge. "Cerveza indigena. Muy buena!" my new friend said, nudging his mates to make sure they caught my reaction to the local brew. This was the "new yuca," which had been grated, mashed and left to ferment to make the Yekuana drink called "yarake". It was a strange taste for somebody used to Stella, Fosters and Polar Ice and it didn't help that my new Yekuana chug-buddies were miming a chewing and spitting action to explain how it was made. But when in Nichare do as the Yekuana do is my motto, so down the hatch went the yarake, much to the amusement of my new friends. Copious amounts were being consumed and it wasn't long before a sweet smell of spoilt fruit started to pervade the hot, crowded room. As the night wore on the party got surreal. The merengue music was playing at a third normal speed because the car battery wasn't powerful enough and the shuffling rhythm of the dancers feet was so loud it became hypnotic. Except for the girls who silently refilled every gourd as it was emptied, everybody was either shuffling or drinking, or shaking my hand, or slapping my back, or stepping outside to make room for more yarake. It was at this point that the festivity took on an indigenous life of its own, (and maintained it for three days). The trappings, like the clothes and the music, were no different from any other bash held down river in the criollo villages of Trincheras, or Maripa, but the monotonous shuffling of those feet, the feeling of community that filled the high-ceilinged roundhouse, the slow-building effect of the yarake was definitely Yekuana. Stepping out of the sweatbox of the hut and into a cold jungle mist it became immediately clear that the yarake was not as weak as I had thought. My head was spinning and for some reason I thought a refreshing dip in the river would put me right. Vaguely remembering Juan Carlos' advice that we should shuffle into the dark waters of the river to warn the electric eels and stingrays we were coming, I decided it would be best to take a running dive straight in. In normal circumstances that would have been no problem, but I was barefoot on wet clay, a little unsteady on my feet and my judgement of distance was less than perfect. Somehow, before I even got to the edge of the bank I was on my back, moving at speed towards the water in an exhilarating yet somewhat scary bobsled position that propelled me into the river with a mighty splash. On the positive side, I was immediately refreshed. The water was warmer than I expected and because of all the tannins had a silky feel on the skin that was not unpleasant. However, I had not reckoned on the difficulties of getting out of the river and it was only after what seemed like an hour of failed attempts to get my wet self up that slippery slope that I finally managed to stagger back to the village, past the party hut, still throbbing with life, and collapse into my hammock. The next day I woke up in classic big-night-out style. Dry mouth, temporary amnesia over the events of the night before and complete confusion as to why my fellow travellers, who had chosen to pass on the Yekuana fiesta, burst into giggles every time they asked how I was. But worst of all I could not understand why I was completely covered from head to foot in a dry yellow crust, or why the cacique kept giving me the thumbs up and with a toothy grin offering me "mas cerveza indigena." Nice story. I have always dreamed of travelling to the venezuelan jungle and your blog entry was so vivid I felt I was there. Did you not worry about drinking that yarake beer? 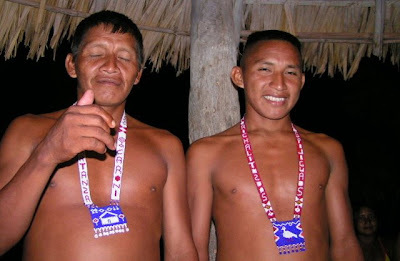 I really want to go to Nichare now and meet the Yekuana people, especially when they have a party! I agree with your introductory statement that the Rio Caura basin is the most pristine rain forest environment still intact in Venezuela but that doesn't mean it is without threat. Illegal mining in the upper reaches of the Caura is having a definite impact on the river sytem and must be countered if the Caura is to remain pristine. I would encourage all those who care about the environment to campaign for the preservation of the Rio Cuara's fragile eco-system and for any tourists who visit to ensure their impact is minimal. I want to travel to the jungle and do what you did. How can I get to the Cerro Autana? Is there a company that specializes in taking people there. I went to the Autana with Vicente Barletta who works out of Puerto Ayacucho in Venezuela's Amazonas State. He also takes people on other tours around Amazonas. He runs a firm called Terekay Adventures but he also works with Akanan. His email is terekayadventure@hotmail.com and his phone numbers in Venezuela are 0414-487-2123, 0212-576-5193 and 0416-838-5637. For the Caura River I went with Akanan Travel and Adventure, which is based in Caracas. Brings back memories - many years ago 1963 or so while living in an Eastern Venezualean oil camp, a missionary visited and offered to take a group down the Caura. I was about 12 or 13 at the time and somehow convinced my parents to allow me to go. We ended up with a group of 8 plus two Indian guides and the missionary, Cedric Eddings. There were 3 guys about my age, a couple of housewives and 3 teachers, plus one employee. We fly by Cessna from Cuidad Bolivar to a small town on the Caura and after spending the night at Cedric's base camp, headed out in dugout canoe (all 11 of us plus supplies for a week in one boat), It was quite an adventure. We killed a tapir the first night out and the Indians smoked it to take to their tribe, while we feasted on steaks. We portaged around rapids, we caught piranha and pavon (peacock bass). We saw electric eels, turtles, mountain lions, and heard numerous howler monkies. After navigating as far south as we could we encamped for 3 days at a beautiful beach and hiked through the jungle one day to the falls which were spectacular. It was beautiful and fascinating. One of my most memorable recollections was that we did not take any water along, but simply drank straight from the river!